After the Christmas celebrations of December have passed, and we have partied the night away for New Year´s Eve…what comes next? January is a time for reflections on the past year, resolutions for the next one, and, of course, a quick getaway to Barcelona! This coming January the Catalan capital will be host to many exciting events for you to experience, not to mention great deals on flights and Barcelona apartments, so there really is no excuse not to treat yourself to a winter break in this beautiful city. 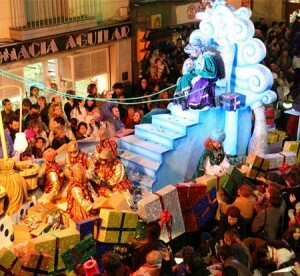 One of the oldest and most important Christmas traditions in Spain is the procession of the Reyes Magos, or the Three Kings. On January 6th families gather to open presents delivered by the Kings and indulge in a special feast, which includes the Roscón de Reyes (above): a sweet Three Kings-themed cake. But, on the eve of January 6th, the Kings, or three Wise Men as they are often known in English, take part in parades in towns and cities all over Spain. The biggest parade in Catalonia is that of Barcelona city centre, whereby locals and tourists alike gather to watch as the each of the Kings passes by on his float. Candy is thrown by the Kings´ helpers to the crowds below while music plays, and up to 1km of festive floats tour the streets of Barcelona. The parade tours a massive 5km and there are around 1200 participants each year! Where: Begins at Moll de la Fusta, Port Vell before travelling around Barcelona, finishing near the Magic Fountain of Montjuïc. 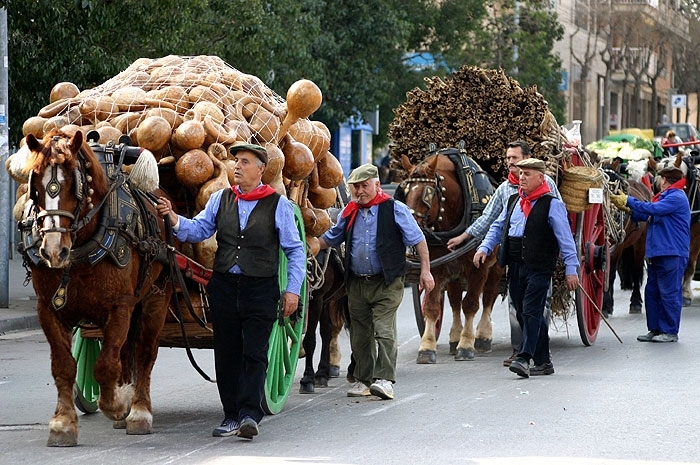 Usually at the end of the first week of January, Barcelona celebrates the Tres Tombs Festival, in honour of the patron saint of animals, Sant Antoni. The Saint´s festival begins on the 13th January and there are many parties throughout the week-long celebrations. 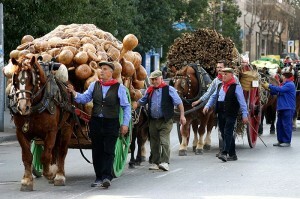 At the Tres Tombs Festival, you will see several horse processions and the blessing of animals by priests. Taking place in the Sant Andreu and Eixample districts of Barcelona, as well as the Vilanova area (around 40 minutes by train from Barcelona), this interesting display of animal appreciation is something you do not want to miss. On the last weekend of January each year, the Sa Pobla Festival takes place in Barcelona´s Mallorcan district, Grácia. Also paying tribute to Sant Antoni, this festival features singers, drummers, red devils and much more. 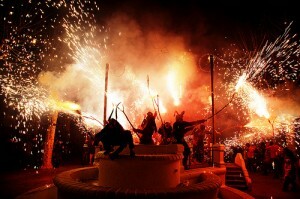 Celebrated heavily in the Balearic Islands, especially Mallorca, Sa Pobla is an exciting event to watch and even more thrilling to join in, as you can participate in the bonfire dances and the traditional Mallorcan fare. Here you will also find some tasty Mallorcan foods such as sobresada: a delicious meat with a pâté -like texture. 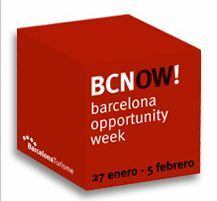 Barcelona Opportunity Week closes the month of January with a bang. Starting on January 27th through to February 5th, BCNOW offers numerous discounts on restaurants, markets, florists, as well as your favorite attractions. In addition to the great deals, a portion of the money spent on some of the offers throughout this week is donated to each specific vendor´s charity of choice. Over 40 restaurants will be offering fantastic deals on otherwise expensive meals and exclusive stores will be giving you the chance to purchase top labels at more affordable prices. On top of all that, there will also be special performances and free entrances to some museums for Set de Cultura, a partner event of the Barcelona Opportunity Week taking place at the same time. Stay one of the Ramblas apartments in Barcelona and head over to the Picasso museum for a free guided tour during Barcelona Opportunity Week! Book one of the many city centre Barcelona apartments now and don´t miss out on the chance to experience some of these wonderful cultural events and top deals that Barcelona has to offer, not to mention all of the other fantastic attractions you will find in the Catalan capital this January. This entry was posted in Events, Home and tagged Barcelona accommodation, barcelona apartments, barcelona events, barcelona festivals, barcelona traditions, catalan christmas traditions, christmas in barcelona. Bookmark the permalink.